Note: these steps are for newer Tiller Google Sheets templates. If your Transactions sheet does not have the blue header row like the image below reach out to support@tillerhq.com for the steps. Open your Transactions sheet and right click on the Account column and choose insert 1 right so that you have a new column to the right of the Account column. Now you should see the group populate for each categorized transaction. If you get any errors at this point, make sure that your Category column is in column D or adjust the formula where it indicates D1:D for the category column to use the correct column letter for your categories. Note: if you use the Transaction splitter, it will paste the group data as a value after it creates a split. Simply clear this manual data out after making splits to keep the arrayformula working. Now you’re ready to create your pivot table. Monthly spending pivot tables are a great way to visualize the total spend per group (and category) for all your Transactions sheet data. You can even add filters if you don’t want to see the spending totals for some groups. A more detailed overview of creating a pivot table is included in this help article, but we’ve included the basic steps below. 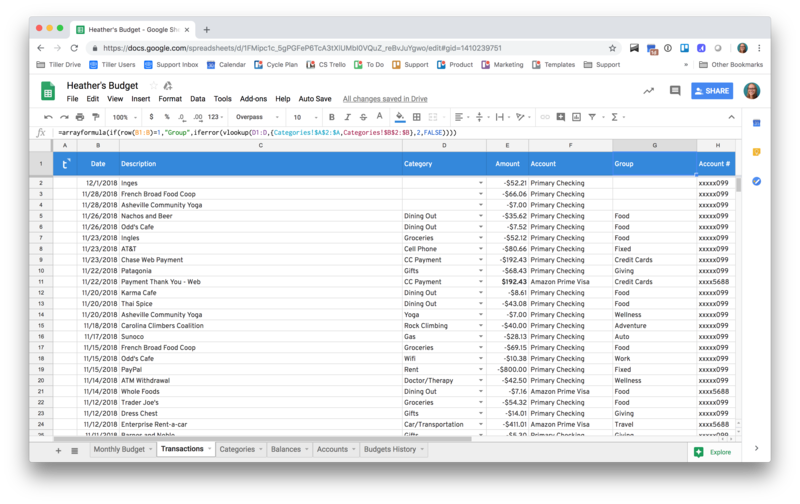 Select all the data in your Transactions sheet using the square in the upper left of the sheet. 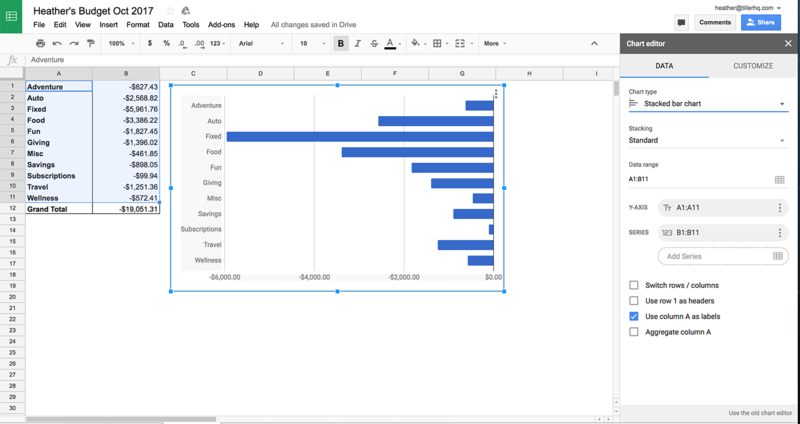 Open the “Data” menu and choose “Pivot table,” which will create and open a new sheet where you can customize the spending pivot table. Choose “Group” for the rows. Choose “Month” for the columns. Choose “Amount” for the values. Now you should see the sum of your spending for each group organized by month in the table. There is a grand total column at the far right of the table so you’ll get the total spend for all months included in the table. From here you can add filters and customize this view based on what you’d like to see. If you only want to view spending groups, you might want to create a filter that hides the data for your income related transactions. You could add a filter for month and only look at data for this year if you have several years of data in your Transactions sheet. You might see a column that doesn’t have a month assigned and a row that doesn’t have a group assigned. If so, it’s because there are blank rows in your Transactions sheet, which is completely normal. You can add a filter for Group and Month and hide the blank lines to make those disappear. If you see any amount totals for a blank month it might be that you have added some manual transactions and the month data is not included. Check the month column in your Transactions sheet and update the month data. If you see amount totals that aren’t assigned to a category it means you have some un categorized transactions. 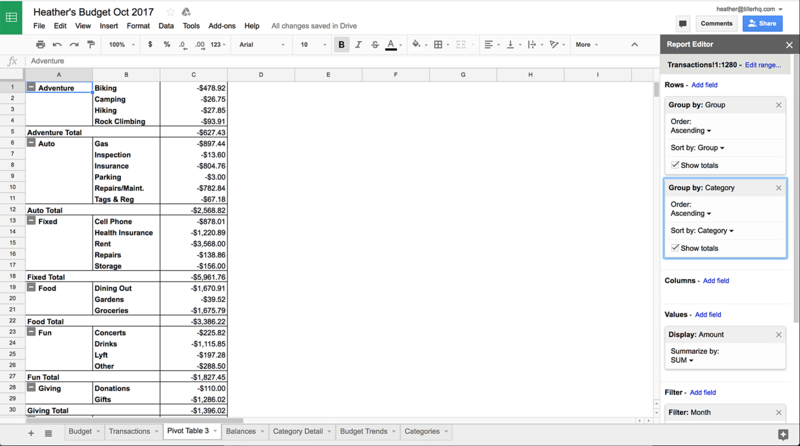 If you add a second grouping for the “Row” data and include “Category” you’ll get a spending breakdown by category that rolls up into the associated group. This is a really great view if you want to see just how much you spent each month per category, but also want to see it side by side in the context of the associated group with the overall total for the group. 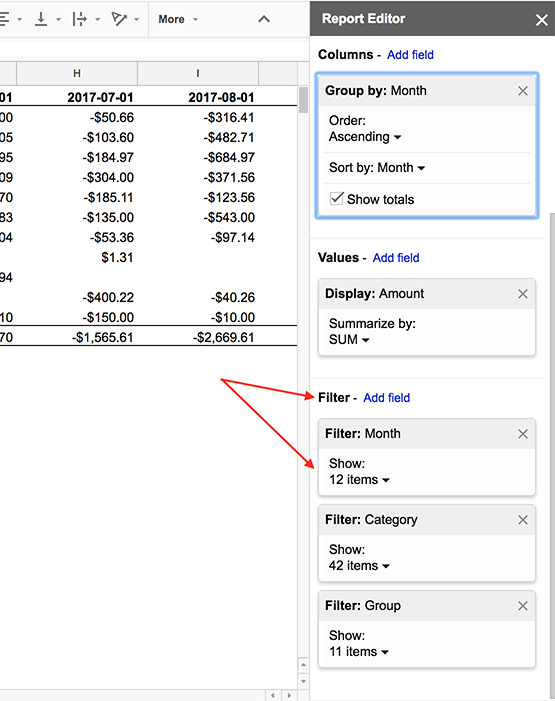 If you only want to see the grand totals, and don’t care about seeing it by month, simply remove the month data from the columns in the pivot table configuration sidebar to get the sum of all spending by category and group. Clicking this button should add a chart, which you can further customize in the chart editor. The best option for this type of data view is a stacked bar chart.